WWOZ will be off the air starting at 12 midnight Saturday August 30th, as the French Market building where we broadcast from will be closing. We'll keep the music going by streaming archived shows from afar, though things may be in flux. - 8/29/08 8:24pm CT"
Last Day of Pledge Drive! and the music you love! Jazzfest is back to 7 days, Brass Passes are available. Get one now! Join us for Fest 2008! Christian Street Furniture is a proud supporter of WWOZ. If your business or organization is interested in reaching WWOZ's worldwide audience through on-air spots or exposure online, please contact Carmen Post at 504-655-0269 or email carmen@wwoz.org. Read more about the advantages of underwriting on OZ! and colleagues about WWOZ. Anyone can easily sign up for the monthly e-mail. It's the best way to stay in touch. We thought about what WWOZ would be like without our wonderful listeners and supporters. You are the reason we get out of bed to come into the studio on cold and rainy mornings. You are the ones we think about when we sit down at Jazzfest to interview the great musicians who have just finished their sets. You are the ones we come to and ask for support during fund drives. You are the ones who gave us a reason to go on the air after the levees broke. Community radio is just what the words say and here at WWOZ we are so thankful that our community extends far beyond the borders of Orleans Parish. WWOZ continues to grow. New listeners find us everyday. Our trips to far off places, to bring you some of the best Jazz Festivals in the country, have introduced us to new Jazz fans and, in turn, they have discovered WWOZ and our commitment to the music and culture of New Orleans and the music we call Jazz. We want you to know that in this season where people show their love for each other, we love you, the members of our WWOZ family. Happy Valentine's Day. * Christine T from Reading PA says: "My soul lives in New Orleans, but my body lives in Pennsylvania. Is there anything I can do to help?" We took Christine up on her offer and she saved us a lot of time with her work from afar on the Top Ten lists we put up last month. * Bill and Pat from Galveston said: "We love the music, show hosts, the live broadcasts and the way OZ supports the local musicians and music clubs. OZ is New Orleans. When we are away from the city, listening via the internet stream maintains our connection." Here's a picture of them on Mardi Gras Day with Dr. John. We Love to hear from you so, keep 'em coming. Derek Tabb is a drummer in the Rebirth Brass Band, one of New Orleans premier groups. After the storm he overheard someone say, "if you aren't part of the solution, you're part of the problem." His solution is to put together the city's largest marching band comprised of middle schools students from twenty different schools. He is bringing together veteran music educators as well as the community to help him with his "solution." That's why we love what he's doing. Come take a closer look at Derek's plans. In a new on-line feature we will be asking each of our show hosts the same three questions. You will get a chance to learn more about our hosts and what makes them and the music they present so special. You can also catch up on former show hosts that have recently left New Orleans. K. Balewa host of the Wednesday morning Morning Set is the first one we asked the three questions. What is the best new CD you have heard that is outside the genre you play on your show? I don't listen to much outside the jazz I play so I'll mention one you may not know, saxophonist, Eric Alexander. Read more about what he said on the OZ web site. What is special about doing a show on WWOZ? I look forward to finding new jazz music and artists. I love that some of the older jazz is finally being reissued on CD. Best of all is the interaction with our listeners and talking to people all over the world about jazz. Check out the web site for the third question and K. Balewa's response. WWOZ show hosts were out there enjoying Carnival. Check out their blogs to find out what parades and parties they attended and watch a video from the WWOZ truck in the Zulu parade. When you live in New Orleans, you have to know a thing or two about costuming. A handful of New Orleanians explain how it's done, what it means, and why it's so darn important. Visit our website to listen and learn more. From 4 until 7p.m. New Orleans Time, Judy Wood's Wednesday Jazz from the Market on February 13th will have a Valentine special called Matters of the Heart. She will feature recent releases about love, joy, setting the mood for Valentine's Day. An Ernie K-Doe special will be held on the Wednesday February 20th Kitchen Sink Show. Special guests will be joining AJ Rodrigue to celebrate the Emperor of the Universe's birthday. K-Doe always proclaimed that he was born on the 22nd day of the 2nd month so we'll begin celebrating a couple of days before his actual birthday. Fun and K-Doe stories will be shared on AJ's show. There is nothing that goes hand in hand with the observance of Lent in Louisiana like crawfish. They normally come into season around the beginning of February and are at their peak a couple of months later. Here's a well known local dish done the local way. Check our recipe page on the OZ web site for Crawfish Etouffee, from a New Orleans listener. Did you not get all of the membership gifts that you thought you should? Do you have any questions about contributing to WWOZ? Then check out our recently updated membership FAQ. Our Membership Director Crystal wants to hear from you if you have any membership questions that aren't answered there. Are you interested in an artist we played on the air? You can now search playlists by song title, band name, CD title or label. There's live music in locations all around New Orleans. We've got a calendar online. Tune in today, Wednesday (January 16th) from 11:30am to 2:00pm CST, as we celebrate Allen Toussaint's birthday (January 14, 1938). From the late 50s to the present, from Devo to Irma Thomas, now's the time to savor some Southern Nights and find those Lipstick Traces, as we listen to Allen Toussaint and those his music has touched. Our Annual 12th Night Party is Bigger & Better Than Ever! Guess which one of us is which! It's definitely Carnival Time when Al Johnson is around! for House of Blues! They gave us a heckuva good deal so we could raise money for WWOZ! C'mon down this Friday night. Click the link to get your ticket. Hi, I'm Laura Guccione from Little Shop of Fantasy & New Orleans Masks. Every year, my sister Ann and I throw a party on Twelfth Night* to benefit somebody special - this year it's WWOZ radio. WWOZ Radio brings you all kinds of great music from opera to jazz to R & B to zydeco every day - without ads. Just listener support! * We know 12th Night was last Sunday, but we couldn't get HOB until this Friday! Wear a Costume - You could win the Contest! This year's combination King-Cake party, Masquerade Ball and Costume Contest will be narrated by Fun-Guy & Famous Journalist Ronnie Virgets. Fun-Gal & Famous Author Poppy Z Brite is this year's Costume Judge. Plus! Special Appearance by Kitty Twist and Perle Noire of Bustout Burlesque! Wait, there's more! K-Doe's Baby Dolls will be there too! We're the same people we used to be at Little Shop of Fantasy. We changed the name after Hurricane Katrina blew the shop away! Visit our website or call us up at 945-2435. We'll be happy to see you by appointment. Thanks for reading this note. We'll be looking for YOU this Friday night! There are just a few days left in 2007. Your tax-deductible year-end gift will help keep the groove going. Help Ensure a Happy New Year for WWOZ! Your tax-deductible year-end gift will help pay the costs required for WWOZ to bring you an authentic New Orleans experience every single day. Donate today to support the music you love and to increase your 2007 tax refund. As the year draws to a close, I find myself reflecting on all that WWOZ has accomplished in this past year. We preserved thousands of hours of live performance recordings thanks to our partnerships with the Library of Congress and the Grammy Foundation. WWOZ went on the road to some of the best music festivals in the country with our two new Remote Broadcast / Recording Trucks. We made significant improvements to our website and to our infrastructure. And, every single day we delighted listeners from around the world with an incomparable blend of music that encompasses the spirit and culture of New Orleans. In short, we brought you more of what you love about WWOZ. Listener support makes everything we do possible. Your year-end gift will help us continue to bring the sounds and spirit of New Orleans to the world and bring you move of what you love about WWOZ in 2008. If you make your gift by December 31, your gift may also increase your tax refund. Thanks for keeping the groove going strong! P.S. Every member and every dollar really does matter and using our secure online form will only take a minute. If you've already done your part for WWOZ, our most sincere thanks. Please forward this message to a friend and encourage them to support WWOZ too. Forward this message to your friends and colleagues who listen to WWOZ. Encourage them to make a pledge too in order to ensure that we can stay above the water line and continue to offer an authentic New Orleans experience every day of the year! Invest in the future and double your money today. Your investment in WWOZ goes twice as far today only! Your donations will be matched dollar for dollar by a very generous donor. You heard us right. For instance, if you donate $60, WWOZ will receive $120. We're doing it all day long, only on Wednesday Dec. 5th! WWOZ will be looking for 600 new or renewing members to join the OZ family. Supporting WWOZ says a lot about who you are and what you value. We like to think that WWOZ is the ultimate New Orleans experience, powered b y people like you. So help us build a future for New Orleans music lovers around the world by renewing your membership orbecoming a new member during our December Power Drive. holiday gift list would love. Your WWOZ membership support can go twice as far if you act now and we'll thank you with a doubloon and other great thank you gifts. Help Power Up WWOZ. Read on for more. 'Oz's Future - More of what you love! More members and a special match from our good friends at Putumayo World Music will make it possible. Help us jump start our December Power Drive. Everyone who pledges $60 or more in response to this email will receive a doubloon in addition to any thank you gift you choose. Take a moment to think about everything you love about WWOZ. We envision a future that brings you more of what you love about WWOZ - The Ultimate New Orleans Experience. We plan to do more live broadcasts, expand our website and streaming, and continue our dedication to preserving and celebrating the culture of New Orleans. We can do all this and more with your support. On Wednesday December 5th we'll kick off a 3 day Power Drive to help us expand our membership. But you don't have to wait, we've got two good reasons for you to act now. Our good friends at Putumayo World Music share our dedication to all that is special about New Orleans. They travel the world seeking out music that is "guaranteed to make you feel good." Their new release Christmas in New Orleans really celebrates the holiday New Orleans style. Putumayo World Music will match your donation to WWOZ. That means if you donate $60, WWOZ will receive $120 to put toward the music you love. Only the first 125 pledges or first $5,000 will be matched so respond today so your dollars can go twice as far. Plus for every donation of $60 or more by midnight Tuesday, we'll send you a WWOZ Guardian of the Groove doubloon in addition to any thank you gift you may choose. If every 'OZ listener gives just a little, it will add up to a lot. Help us continue to bring the sounds and spirit of New Orleans to the world and bring you move of what you love about WWOZ in 2008. P.S. Every member and every dollar really does matter. Please pledge today so we can maximize this generous match from our good friends at Putumayo World Music. Thanks. Thanks for providing WWOZ with the tools we need to provide you with an authentic New Orleans experience every day! Help us jump start our Fall Membership Drive and we'll say thanks with a cool key chain tool if you respond by Monday. An authentic New Orleans experience every time you tune in or log on. That's what you get every day on WWOZ. As a listener-supported, community radio station, we can only do what we do because of people like you who love and celebrate the music and culture of New Orleans. You provided us with the tools to fix our house after Katrina and now, thanks to your support, 'OZ is high and dry above the water line. But in order to stay there and reach new heights, we need your support now and the help of your friends and colleagues. 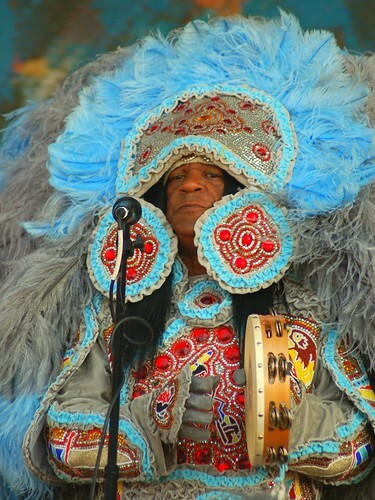 Even within New Orleans we're the only station committed to celebrating and preserving our culture. This coming Monday we begin our semi-annual membership drive. The drive will bring you ten days of great, live music from the studio, likely some surprise guests, and an opportunity for our volunteers to invite 'OZ listeners near and far to join the 'OZ family and demonstrate commitment to preserving the groove. These semi-annual membership drives represent the largest source of WWOZ's annual operating budget. If every 'OZ listener gives just a little, it will add up to a lot. It will add up to solid assurance that we can stay above the water line and continue to bring the sound and spirit of New Orleans to listeners around the world. Help us build momentum toward our goal. It's like building a house. We need you - one of our most loyal listeners- to help lay the foundation for a successful membership drive. If you make your pledge by Monday, October 8, we'll show our appreciation by sending you a very cool tool kit key chain (did you know they make such a thing?) in addition to whatever thank you gift you might select. New thank you gifts include our CD entitled "Don't Touch That Dial", a cool flag, and the 2008 Brass Pass. Keep 'OZ going strong by responding today. P.S. Every dollar makes a difference. Your support at whatever level is right for you will go a long way toward keeping us above the water line. Use this secure form to pledge your support now or if you'd rather pledge by phone give us a call at 1-877-907-WWOZ (9969) Thanks again. If you would like to receive this newsletter via email, you can sign up for WWOZ. I got word that we lost Andy Ridley. Ridley hosted a variety of shows on WWOZ in the 1980s and 1990s, most famously "Jazz Tenors" and "From Bunk to Monk". I'm told he died in his home here in the city, and obit/funeral notice should be in tomorrows Picayune. I'm delighted to let you know that, thanks to our friends at Voodoo, WWOZ is once again offering special WWOZ Hospitality Passes for the VOODOO MUSIC EXPERIENCE, to be held in New Orleans City Park October 26th, 27th and 28th, 2007. The WWOZ Voodoo Passes are available for $175 (same price as last year and this year you get an extra day). The passes grant you in and out access to the festival and SO MUCH MORE. Take a look at this year's lineup! Enhance your experience with WWOZ VIP access at Voodoo. You will enjoy backstage access at the WWOZ stage where refreshments will be served throughout the day. We have a LIMITED number of OZ passes. Get yours today while they last! See you at the Voodoo Music Experience! P.S. Please note that the WWOZ Voodoo passes will be available for pickup soon (we will email you to let you know when they arrive at the station) at the WWOZ offices, 1008 N. Peters, NOLA, across from the French Market. All passes must be picked up prior to the festival. WWOZ's own Billy Delle is on page C-1 of today's Times-Picayune. We'll always remember where we were two years ago today. I'm writing to you to share some of the progress we've made since then and to encourage you to commemorate the two-year anniversary of Katrina with a gift to WWOZ. When Katrina hit New Orleans on August 29, 2005, WWOZ’s fall membership drive was just weeks ahead of us. Our coffers were low and suddenly we found ourselves without access to the offices and studio, and not knowing if the radio tower was still standing. There was no indication of when we would be allowed back into the city to survey the damage. There was no way to conduct the fall drive. In those bleak days and weeks following the storm and subsequent flooding, we didn’t know if WWOZ would survive. Fast forward to today. Two years post-Katrina, you and I know that ‘OZ not only survived, but has thrived to heights we never could have predicted back then. You and your fellow ‘OZillians made the difference. You came to our aid when WWOZ needed it most and we dedicate every day to returning that favor with the music and information we provide to you on-air and via our new and improved website. Street Talk, ‘OZ’s tell-it-like-it-is cultural news service, was directly inspired by the lack of information and misinformation circulated about New Orleans after Katrina. WWOZ has always served as the voice of New Orleans culture and as a source of information about the music community, and now that role is more important than ever. WWOZ’s Street Talk reporters are hard at work gathering and sharing stories of New Orleans recovery and renaissance, like the one about the reopening of Willie Mae’s Scotch House (home of “the world’s best fried chicken”), and the recent “The Wild Mohicans” feature, a glimpse at one Mardi Gras Indian tribe and how they are working with other tribes to keep the tradition alive in New Orleans. There is still much work to do, but it is important to recognize that New Orleans and WWOZ have come a long way in two years. Your pledge today will help us continue to make progress in our mission to preserve the culture and vitality of New Orleans. P.S. Every dollar makes a difference. Thank you again for doing your part. Monday morning 9 to 11 am, the traditional jazz show will celebrate the music of the late Jacques Gauthe. Judy Wood will do a tribute to Alvin Batiste from 5 to 6 PM on Jazz from the Market this Wednesday, May 9. It will include excerpts from her interview with him on August 31, 2006.